I can’t wait to share today’s recipe with you- it’s delicious, healthy, and full of juicy summer flavor. I just love a watermelon salad! The recipe today comes from another talented blogger, “The Tasty Gardener“, my pairing for this month’s Secret Recipe Club. The Secret Recipe Club is a really cool group I joined a little while back. Every month, we are assigned a new blogger. We get to pick ANY recipe that blogger has written about and cook it up ourselves. We can make adjustments according to our tastes too. All of the bloggers post their results on the same day and we all get to see who had who and more importantly, what delicious dishes were made! Place lettuce in a bowl or tupperware container. Add chopped ingredients and top with mint and cilantro. Add with other salad toppings such as sunflower seeds and olives and lightly sprinkle with salt and pepper. Add 1-2 Tablespoons Balsamic Vinegar and ENJOY! The original recipe was more like a side salad, but I wanted to turn that recipe into a lunch appropriate salad with fresh lettuce and more veggies. 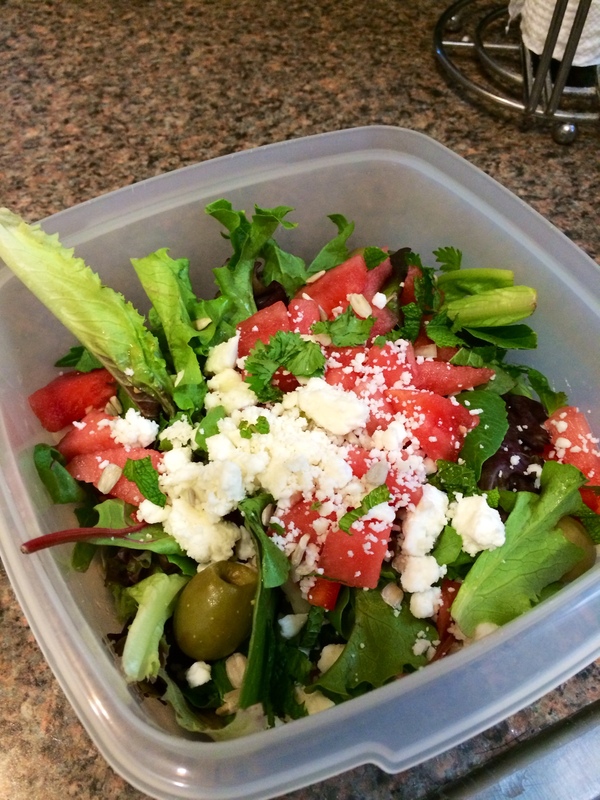 The flavors are just fantastic and the juicy watermelon is such a nice addition to my lunchtime salad. It gives not only a sweetness but a crunchy texture bursting with flavor. I loved it! I saw something like this on Top Chef many moons ago and have wanted to give it a whirl – just afraid of the “different” taste combination. Looks fantastic! So glad you tried my recipe. Salty and sweet are two of my favorite flavours.! 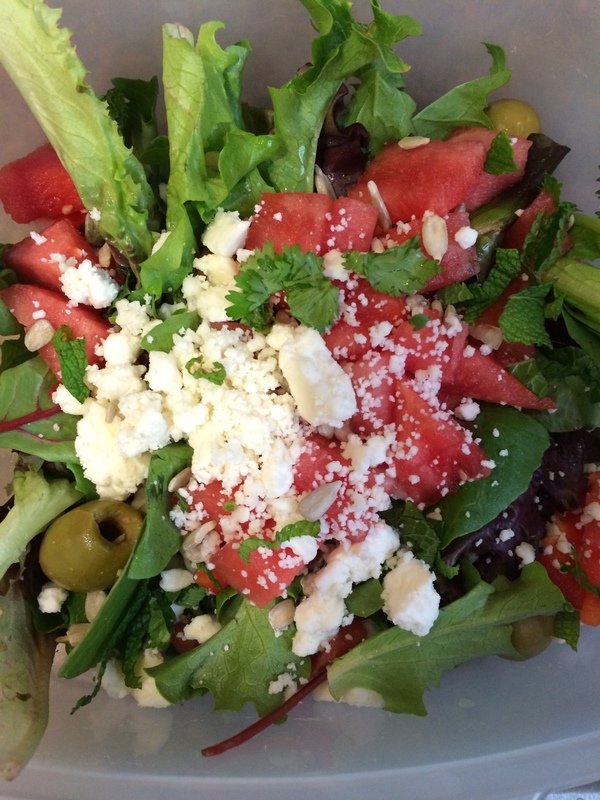 I adore watermelon on salad and the salty feta is a perfect addition. This month I was assigned your blog and made your roasted grape tomato, garlic & poblano ragu…totally delish! Thanks for a wonderful recipe. That looks so good! I tried a watermelon feta salad once, but I wasn’t a big fan. I don’t know why, because I love all the ingredients. Your pictures have me convinced I should give it another try. I love the addition of the greens.